Five PHOWN records have been submitted for Tanzania, most by Anne Outwater. Anne's excitement about the PHOWN project led her to write a newspaper article, in the Daily News online in Tanzania. 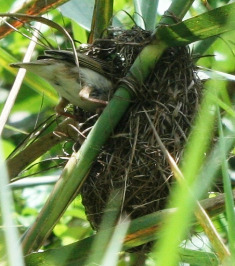 Photo: Zanzibar Bishop, female at nest (VM 1852, Anne Outwater).